Most of us know what a helicopter parent is, since it is a relatively self-explanatory phrase. While there are typical behaviors that show themselves amongst children of the helicopter parents, each personality type will feel different from this behavior. 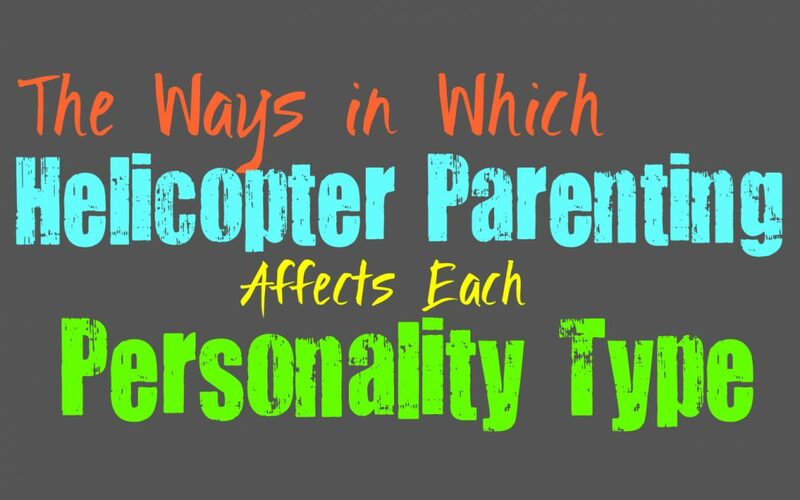 Here are some of the ways in which helicopter parents can affect each personality type. For INFJs having a parent that hovers over them constantly is deeply exhausting for them. Not only does it cause them to feel on the edge and anxious, it really hold back the INFJ in the future. They are definitely affected by this type of childhood, and often struggle to really step outside of their own comfort zone because of it. While the INFJ might be capable of functioning as an adult, they still find themselves incapable of taking risks. They might be fearful of taking steps in their, like applying for a new job or going on a date with someone new. For the INFJ who has experienced helicopter parents, it causes them to value themselves less instead of more. ENFJs who have experienced a helicopter parent, are often fearful of making mistakes even more than they ordinarily would be. They struggle to cope when they have failed, because they are afraid this might upset their parents or cause more stress than they want to. While most children of the helicopter parents seem incapable of functioning on their own, the ENFJ is often affected in different ways. They still find themselves capable of taking care of themselves, but they often turn to their parents simply because they want to please them. This prevents the ENFJ from living their own lives in a lot of ways, or in taking risks they would want to experience. For INFPs having a helicopter parent can create a more helpless lifestyle for them. Since INFPs already live so much inside of their own minds, having parents who constantly do things for them can make this into a problem for them. They find themselves incapable of really handling their own affairs, and might prefer being able to turn to their parents for assistance. This INFP can sometimes find themselves asking for a lot from their parents as they grow up, since they don’t really know how to function any other way. This INFP will need to break away completely in order to finally learn how to function without the help of someone else. ENFPs who have experienced helicopter parents often feel immensely frustrated by this as they grow up. They are naturally independent people who prefer to have their own freedoms and space in life. If they are raised by parents who hover the ENFP might experience a lot of reckless and combative behaviors. They want to try and fight against this, but at the same time will have certain things they might struggle to really do on their own because of it. The ENFP might bounce from being with their parents to being in a relationship with someone who tends to certain practical needs which they have failed to really learn. The INTJ who experiences helicopter parents definitely struggles with this growing up. They are naturally independent people and might even seek to break away from their parents earlier because of it. They have a hard time really coping with this parenting style, and might even find themselves researching it as they get older, in order to understand the situation better. For most INTJs this causes them to feel a strong need to separate from their parents in order to have their own life. For the INTJ who does not break away this can affect them quite a bit. It will cause them to struggle when it comes to more practical and common sense related things, and yet they find themselves unaware of this. ENTJs who are raised in a helicopter household will have a hard time really accepting this. They are often strong-willed even as children, and have a desire to take care of most things themselves. When they have parents who hover it is more likely to put pressure on the ENTJ to be impressive and even more successful. They have a hard time feeling like they have disappointed others and so they find themselves under a lot of stress as children. They are often still capable of functioning on their own as adults, but still find themselves looking to their parents in hopes that they are pleased with them. INTPs often have a hard time growing up with helicopter parents, since they are naturally independent people. This will often affect them in different ways, causing the INTP to struggle with their own thoughts and feelings before actually figuring out why they are feeling overwhelmed. As the INTP gets older they are likely to research this and work towards understanding their helicopter parents and how to really cope with this. When they are younger it is likely to cause some trouble with anger, since they don’t fully understand why they feel so smothered. ENTP children who have to endure life with a helicopter parent, often search for many different coping mechanisms. It is common for ENTPs to use humor as a way of deflecting, but their humor often morphs into a deep sarcasm and might be a bit sharper than the typical ENTP. They use this as a means of escaping their frustration and expressing things without having to outright say it. The fact that ENTPs are naturally independent people makes it difficult for them to grow up with a parent who does not allow this. They might need to break away from a young age, or they find themselves internalizing and becoming incapable of really providing for themselves in a functional manner. ISTJs who grow up with helicopter parents can have a hard time really coping in the future. They find themselves trying to compensate for it, because they want to find ways to make their parents proud. They often feel even more pressure when their parents hover, and realize that they are constantly being watched. The ISTJs with helicopter parents do their best to live up to expectations, instead of finding it hard to take care of themselves they often try to take care of everything. When ESTJs endure helicopter parents it often causes them to push even harder to be successful. It puts pressure on the ESTJ to push even harder and impress their parents because they know they are always watching. For the ESTJ being efficient is important, but at the same time they want to live up to the standards of their loved ones. The pressure can sometimes be overwhelming, causing the ESTJ to feel like they have to constantly strive to be what their parents want them to be. ISFJs who have helicopter parents find themselves prioritizing their parents needs instead of their own. They are naturally people pleasers and so when their loved ones want something from them, they go out of their way to make it happen. They can have a hard time functioning out on their own, since they spend so much time trying to be what their parent wants them to be. This causes the ISFJ to lack certain life skills, since their parents might have prefered to take care of those things for them. ESFJs who have helicopter parents often take this upon themselves, and strive to be someone their parents don’t need to watch out for. They constantly adhere to their parents wishes, so that they can make them happy and comfortable. The ESFJ will constantly feel anxious and like they need to do everything perfect so that their parents do not become upset or stressed out. They work so hard to make sure they do things right, so that they don’t cause their family any upset. This can cause the ESFJ to try too hard to please their parents and so they forget to learn certain day to day coping skills. ISTPs are often very independent thinkers, who prefer to be on their own most of the time. They don’t like feeling someone hover over them, especially not their parents. When they grow up in this type of household they often challenge it constantly and can sometimes behave more recklessly because of it. Many ISTPs find themselves wanting to break free from a young age, in hopes of escaping the hovering parents control. ESTPs who have endured helicopter parents find themselves wanting to find ways to grasp their independence. When they feel like they are being smothered they might try to combat this by challenging their parents authority. If the ESTP lives with their helicopter parents for a long time, they might miss out on certain day to day skills they would normally learn. They might seek to live on their own but will often search for a partner who will likely help replace the parents in some ways. The ISFP who experiences helicopter parents will often struggle to find their independence. They rarely feel like they are truly good enough, since their parents are often on their backs about everything. For the ISFP this is very draining to their spirits and can leave them feeling a bit lost. They might find themselves searching for a romantic partner, someone who can rescue them from their current situation. ESFPs who have helicopter parents might struggle to gain their independence, but this is important to them from a young age. They will likely challenge this authority and find themselves wanting to seek out their own experiences. If their parents smother them the ESFP is likely to try and find a way to move out on their own, but this sometimes involved a romantic partner to help replace the parents in some ways.